Argentina's short-lived World Cup campaign in Russia this summer has only reaffirmed the national team's torrid time in football in recent years. The tournament saw a lot of pressure being mounted on Argentine ace Lionel Messi, with hopes of him single-handedly taking the team to victory. The exit saw the sacking of coach Jorge Sampaoli who has since been replaced by interim boss Lionel Scaloni. After the World Cup, the five-time Ballon d'Or winner told the FA that he would like to be excused from playing for the national team for the rest of this year. Despite Messi's break, the Argentina FA has made it clear that they would not allow any other player to take his number 10 shirt in the hopes that the Barcelona superstar will make a return to international duty. Argentine legend Diego Maradona has now given his verdict on Messi's future in the national team stating that the Barcelona made should make a permanent retirement from international football. 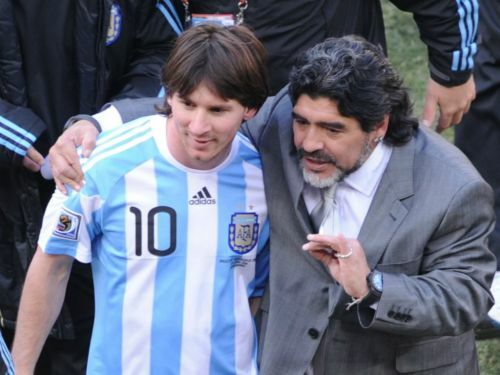 Speaking to Clarin on Sunday, Maradona said, "What would I tell Messi? To not come back anymore. To retire. "The Under-15s lose and it is Messi's fault, the fixture list in Argentina puts Racing against Boca and Messi is to blame. He is always to blame. Stop breaking my b**s."
Maradona, who had managed Argentina during the FIFA World Cup 2010, continued: "I would tell him: 'don't go anymore, man'. Let's see if they can handle that. Let's see if they're really big men. "I would have liked to see him tell us all to f**k off. Because he is not to blame for us not being world champions. Fine, we all placed our hopes in him, but when you go to the racetrack you hope your horse wins and he comes in eighth. " He really does just want him to quit before he can win a World Cup and basically dust Diego completely to the background. Feels strange when Maradona makes sense. Rarity in its purest form. It's quite unfortunate that if you club #Dibala & #Icardi both still it will not match #Messi. At this stage such baseless comments from #Dona is unacceptable. Rather they should find the way.